Vintage Racing Club of BC | Minis Rule in Kamloops! 21 Sep Minis Rule in Kamloops! Lordco Auto Parts in Valleyview hosted a Car Show in their parking lot on Sunday, September 18th, with all of the proceeds going to aid the Kamloops Food Bank. Maybe we are biased but the highlight of the show for us was the above trio of Minis. They perfectly illustrated the versatility of this long time favourite. Jim Clark’s completely original, orange 1976 Mini 1000 is in the middle. It was imported from Australia, which explains why the steering wheel is on the ‘wrong’ side. 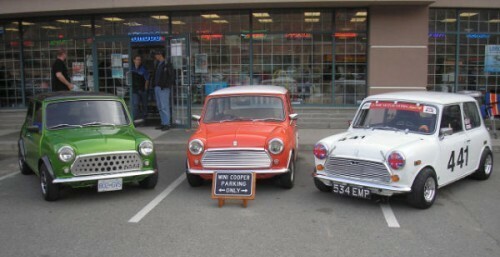 The green one on the left is Simon Griffin’s 1974 Mini. It is an excellent example of a modified – but still streetable – car, with its Weber-carbed, bored-out 1100 cc engine, Cooper S front disc brakes and a full custom interior. Simon’s car took 1st Place in the Peoples’ Choice Award over about 90 other cars (mostly American ‘muscle’) in the day’s Show and Shine! The white car on the right will be very familiar to local Vintage race fans. It is VRCBC member Geoff Tupholme’s full race version of a 1973 Mini with a 1293 cc engine and many ‘go-fast’ tweaks. (You will be able to watch Geoff and many other Vintage racers at the season’s final event on October 9th at Mission Raceway Park.) Check out the engine photos below.